Do you ever stop and think to yourself, “Wow, if I hadn’t had that particular experience, I wouldn’t be in the place and position I am in today?” For Quisha Wesley, a TeacherReady® alumna, this was a familiar and frequent thought that came full circle this month at Studer Education’s℠ What’s Right is Education conference in Chicago. A few months ago, Quisha decided to accompany her mother, a Nursing Manager for the VA hospital in Richmond, Virginia, to Studer Group’s® What’s Right in Healthcare conference. Coincidentally, on the first morning of the conference, Quisha and her mother accidentally stopped by the education registration table, thinking it was the line for healthcare. 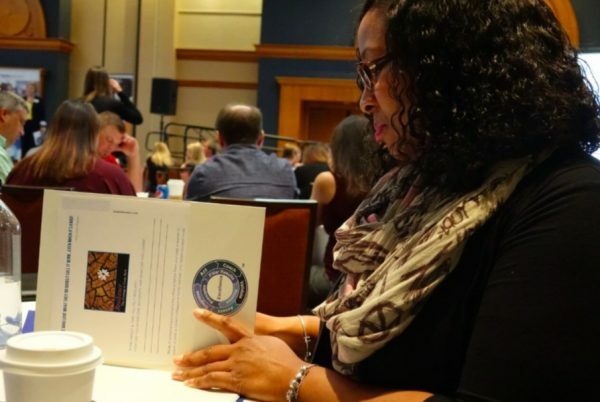 After speaking briefly with one of our team members, who serves the TeacherReady® division of Studer Education℠, Quisha made the connection and began to reflect on the journey leading up to that very moment in Chicago. Graduating in 2001 from North Carolina State University, Quisha was a single parent raising a newborn baby with Cerebral Palsy. She was also struggling to find a teaching job. For a while, she worked as a substitute teacher, but knew she wanted more. She began applying to various institutions to receive her teaching degree. However, she was missing a few of the prerequisites needed to be accepted. Living in Georgia at the time, she decided to get a Georgia Provisional License, which allowed her to teach at a school for up to five years. With this temporary license, she was finally hired as a teacher. Teaching ignited a fire within Quisha. She knew this was her passion and purpose in life. Inevitably, Quisha was reaching her five-year limit. She did not want to give up on her dream and realized she needed to take the necessary steps to become a certified teacher. Just before all hope seemed to be lost for Quisha, she stumbled upon the TeacherReady® Online Certification Program. She had never considered an online solution, but thought this would be perfect, especially since she was still working and taking care of her child with special needs. Quisha figured this may be too good to be true and worried she wouldn’t be accepted due to the various prerequisites she needed for traditional institutions. However, because Quisha had lots of field work experience and strong recommendations from her school leaders, she was admitted into the program and certified within a year. Quisha’s passion for being an educator and her relentless commitment to learning is inspiring. She continues to utilize TeacherReady® tools and resources to enrich her student’s learning experience. Not only is Quisha a stand-out teacher in the classroom, she is a model leader of “what right looks like” to both aspiring and current teachers.